Dutch bass player Robert Kramers started his career with the band Ligimo performing in the North of Holland. During his college time he founded with friends the band Jam Square. In November 2008, Robert joined the Dutch band Alderliefste. His first solo album was released in spring 2012. Robert describes the style of his project as smooth funky R&B and jazz. He is joined by H. Reijs, I.P. Wenzel (keyboards), R. Alexander, J. Dolleman, J. Winder (saxophone), C. Garai (vocals), M.A. Bakker, R. Briganti (guitar), I van Drooge (drums) and many more. Robert opens the album with the dynamic Back To Now. His performing style reminds of Stanley Clarke's and Marcus Miller's percussive funk slap technique. The song has a constant flow, Henne Reijs' keyboard accompany is intelligent and diversified and the surprising percussion bridge is the icing on the cake. Wenzel's instrumental programming on Wond'Ring 'Bout You seems to be influenced by Maze's Can't Get Over You. I love these in depth going arrangements. Rick Alexander takes a smooth lead on alto sax. Although I am not a friend of rap, I must admit that Robert's rap seamlessly fits into the melody. Christina Garai brings a silky vocal touch into the album with Can't Live Like This. The song is still very bass and percussion oriented keeping balance to the vocal component. Black Or White starts with a raw and edgy rap, then adds horns and organ, finally Robert throws his bass in the ring. Musical tension increases to a certain degree the listener's focus. Enjoy the pure bass sound of Sand Mountain Joy, fretless bass at its best. Take Off is a promise and a keeping. Robert Kramers (bass) and M. van Bruggen (keyboards) reach new heights of excellence. Zsolt Rimes' Omage is a Latin tingued melody in the style of Marc Antoine. The slow paced Balaton Beauty is dedicated to the horns, especially T. Stencli on sax and J. Gloerich on trumpet are superb performers. When rap and urban beat meet a fat synth bass, then it's time for Gimme The Beat. Christina Garai's vocals are a blast! The curtain falls down with the slow tempo Stars featuring singer L. Koster. Both contemporary songs with young audience in the center of attention. 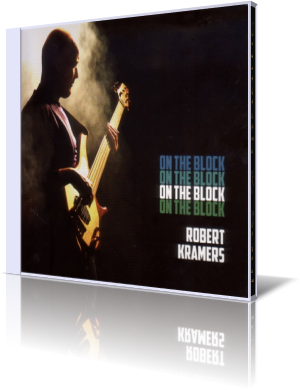 Robert Kramers debut On The Block will absolutely enthuse lovers of bass and beyond. Captivating melodies with high potential.